It is not necessary that the player who has won the most number of points, wins the match. You may win more points and games than your opponent and still end up losing the match. So as some argue, clearly every point is not as important as the other. So what I will do is, I will step aside and I will let an able substitute teach you a few tennis tricks. You see it helps if the able substitute happens to be the present World no. 1 on the ATP Circuit and the winner of three Grand Slams in the present calender year. Now that’s note a badÂ substitute, is it? As a tennis player, you need to keep yourself hydrated all the time- in other words, keep re-hydrating yourself- since the body loses fluids through sweat and urine. Donâ€™t wait till you are thirsty to drink water. Thirst is a sign that you are already de-hydrated. Keep sipping on water continuously. Force yourself and your kids/students to keep drinking water at regular intervals. Then, slowly, it will become a habit. Think of it this way- You donâ€™t wait for the fuel to run out completely before you re-fuel your automobile, do you? Similarly, donâ€™t wait for yourself to feel thirsty- it is a sign that the bodyâ€˜s fuel tank is empty. Re-fuel it (with water, sports drink & coconut water) before you feel thirsty. We have a student (a 10 year old boy) at our academy who thinks a lot. Now this guy has a decent build, moves fairly well while doing fitness off-court. Serve Vs. Return of Serve – Whom would you bet on? I was watching the U.S. Open menâ€™s final the other day and it was a treat to watch Djokovic and Nadal â€“ the two champions â€“ battle it out. According to me, the thing that tilted the match in Djokovicâ€™s favour was his superior return of serve. Djokovic, along with Andy Murray, possesses one of the best returns of serve in tennis today. How to watch the ball? Yes, I believe it is the most neglected tip in tennis. Most players donâ€™t watch the ball. They just see the ball â€“ or watching something like the ball. Let me ask you a question: does the ball rotate on a ball toss for the serve? How much? Can you do the ball toss and check? Using Overheads to better the Serve! We had a new student (with wonderful potential, I may add!) join our academy recently. Good forehands, nice backhands, good energy â€“ but quite a poor serve. There were a lot of things that went wrong with the serve. Yes, he had a poor toss. He also kept his hitting arm very stiff & straight while hitting the serve â€“ his arm didnâ€™t have that natural bend from the elbow. But what was really bad was that he kept mis-hitting his serve every now and then. He would try to really hit the ball very hard with the serve â€“ but the ball would not hit the sweetspot of his racket and would go into the opposite side without too much power. One basic thing that I learnt while playing tennis is that each grip (the way you hold the racket) has its advantages and limitations. And let me be very specific here to the forehand groundstroke. As I have mentioned in my earlier blogs http://www.samasamtennis.com/index.php/2011/02/using-the-right-grip/ ,there are three basic grips with which to hit the forehand. Please note: To get the correct bevels, the the racket has to be held with the racket head vertical to the ground. Of course, there are a few iterations in between these basic grips. Some have a text book grip while others have an extreme grip. The Eastern forehand grip will naturally produce a flat stroke. That is the characteristic of the eastern forehand grip â€“ a flat stroke. The Western forehand grip will produce a topspin stroke. It is almost impossible to hit a flat stroke with that grip. Hence the characteristic of the Western forehand grip is a topspin stroke. The Semi-Western grip will naturally add a little bit of topspin to your stroke, but the topspin will never be as excessive as with a western grip. So my request to all players is: Respect the natural characteristics of your respective grips. Donâ€™t try and hit flat strokes with an extreme semi-western grip. You may get a couple of them in but it will result in a lot of errors. Similarly, donâ€™t try to play with excessive topspin with the eastern forehand grip. The grip isnâ€™t suited for that purpose. Rather work hard to maximise the advantages of your grip. If you use the western grip, work on hitting a lot of short corners. That way you can move the opponent a lot. With the Eastern forehand grip, you will be able to take the ball early and hence rush the opponent. Respect the characteristics of your grip and you will not go very wrong. In the process, you will make fewer errors. It’s Raining, What to do? The rainy season is well and truly on. Until the beginning of August, our academy would probably have lost a maximum of three sessions due to rain. 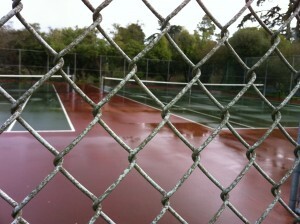 However, since the past week, there has been a constant downpour; as a result of which I and the AUDA-NEO-PITA academy kids have not visited the tennis courts for the last six days!